Cabbage and Cocktail Weenies. What’s not to Love? Chef Carl Binus “The Duke” was out west for New Year’s Eve 2019 festivities. We hit the night spots and ended 2018 at a huge party at Union Station. So what are two hungry bachelors ready for on New Year’s Day? We decided to assemble what is considered a good luck meal, based on a tradition that goes way back. I’m pretty sure it originates from the deep south. The traditional Southern and Soul food of black-eyed peas, mustard greens and pork cutlets. Just to add a nod to old Germany (where both of us started on the journey to become decent cooks) we came up with a cabbage dish with a uniquely party style accoutrement known as the cocktail weenie. Perhaps a bit for the humor yes. But the flavor and finished dish was outstanding. This recipe is going in my Good Eating Pantheon of excellent side dishes for grilled beef and pork. It goes a little something like this. 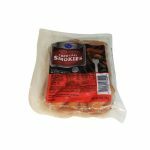 1 package of fully cooked Cocktail Smokies. Ours were from Kroger. First, season one half of the cabbage with Cayenne Pepper. Dust the cabbage with a sprinkling of Slap Ya Mama. Lay a layer of onion pieces. Place another layer of chopped Wax Peppers. Allow this mixture to sit at room temperature for a few hours. 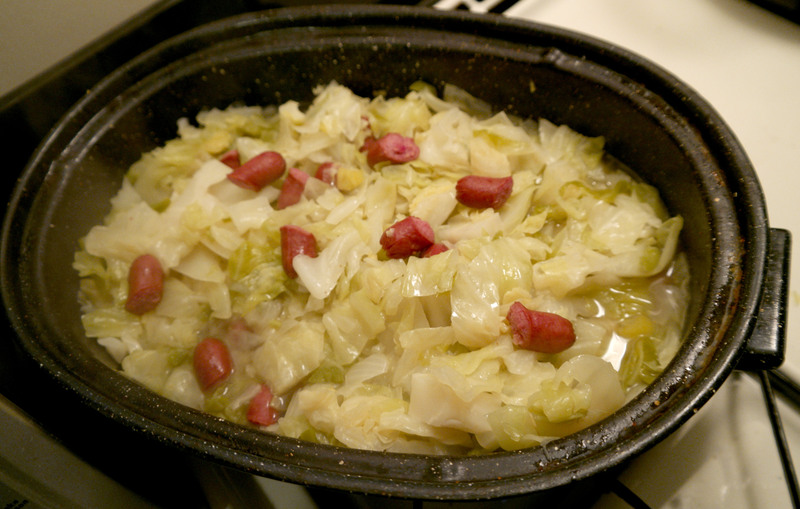 Take the other half of the cabbage and add to boiling water (3 cups) in a large Dutch Oven or pot. If you like it spicy hot and more salty, sprinkle this first layer with cayenne and a bit of Slap Ya Mama. Reduce to simmer. 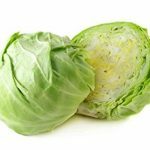 At about 20 minutes and when the first layer begins to reduce, place the remaining cabbage into the pot and cook for another 20 minutes. Add water if the reduction has allowed the tops to become dry. Add Vinegar and salt and pepper. 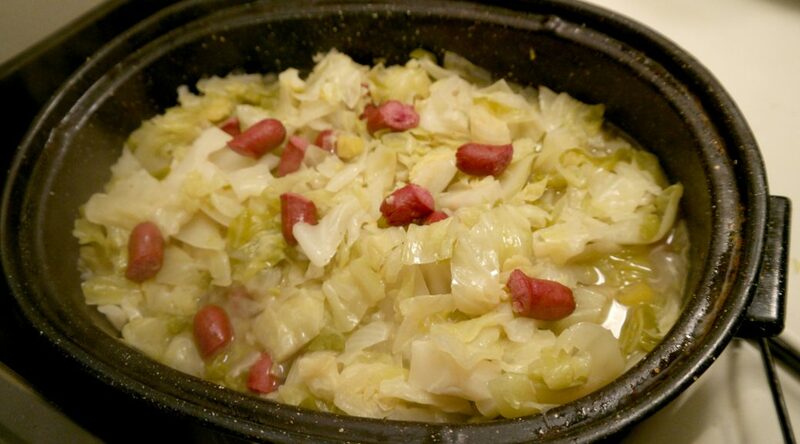 Cook for another 20 minutes or until all the cabbage leaves are glassy and a darker green. Stir. Let rest while all the flavor infuses itself into the cabbage.